I am currently listening to a lovely piece of music by Seth Lakeman called spinning days… this put me in mind of what I am to this morning.. This is a lovely 56s English wool – dyed in my colourway – Cottage Garden. I sort of have a flower in mind, but don’t know the name.. all suggestions greatly appreciated !! Paperwork seems to have escalated again in the “T Roadshow” and I am still struggling typing more than three words as a time without making a spelling mistake, so am going to go and do some more dyeing this afternoon. Now there is a surprise… !! Got my kit from Pure Tinctoria this morning, and oh dear, no wound or mordanted wool – must address this !! The kit is compact and bijou – so first had to go and find some way to enlarge the instructions (my eyesight is not all it should be at the moment). 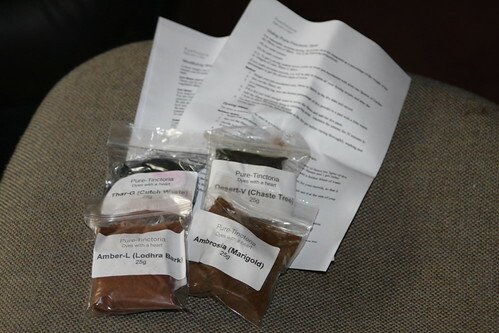 I ordered Spring – which is lodhra bark, marigold, chaste tree and cutch waste, so really excited to see how these turn out. Autumn is leatherwork season as far as Mr Craftsman is concerned… so Odincraft has blogged today. His new project is incredibly exciting and very tactile. 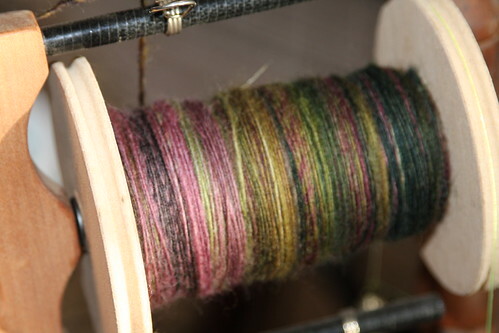 I have almost been convinced to go and join the group for the rest of the autumn – might have to if I want a case for my spinning tools !! Thanks everyone for the lovely comments and suggestions you have made, I really appreciate you taking the time to stop and visit my blog, and even more when you take the time to comment. I have had some super ideas from you and will be taking one or two of them further, thank you for the inspiration.